Tom: So Dan, we talked a bit about Game Salute in our last interview but we didn’t really get the whole story. Tell me about Game Salute. What exactly is it? Dan: Hi Tom. Thanks for taking the time to chat with me about Game Salute. Game Salute is a company dedicated to providing tools and services to make the tabletop games industry better. We actually just updated www.GameSalute.com to better explain how we achieve that goal, whether from the perspective of a gamer, a store, a designer, or a publisher. Tom: I noticed the updated website. It’s very nice and easily navigated. So why did you start Game Salute? Dan: We started it because we love games and we want the industry to expand and grow. We can do that by increasing the overall quality of the tabletop games industry, amping up the professionalism, and helping to enable higher quality games, along with more opportunities to share them. 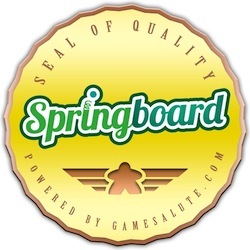 Tom: I’ve noticed the ‘Springboard Seal of Quality’ website and on several Kickstarter games. What is Springboard? Tom: Game Salute is also a fulfillment service to game companies. Most gamers don’t even think about ‘fulfillment services’. It’s pretty invisible. Explain it so they will not be in the dark anymore. 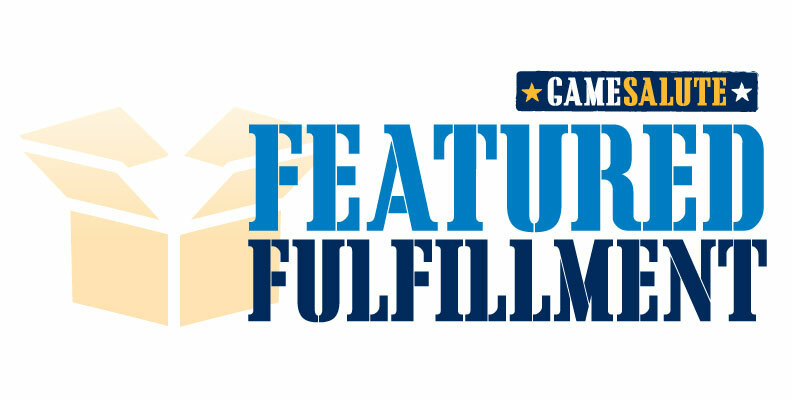 Dan: Our Featured Fulfillment support includes a ton of elements from receiving, warehousing, picking, picking, sales, payment processing, shipping, tracking, customer service, and everything else related to managing physical games and getting them where they need to be: in stores and at gamer’s homes all around the world. Tom: You have some really interesting people involved, from podcasters Russ Wakelin of D6G and Cody Jones of Game On! (as well a certain Sara Yarrington) to game designers/publishers David MacKenzie of Clever Mojo Games and The Kirkmans of Dice Hate Me Games. How did you get such stellar crew together? Dan: We’re very happy to have a dedicated group of passionate professionals who eat, drink, and breathe games. Many of them have joined our team to further the goals of Game Salute and help publish and share awesome tabletop games. Even more folks have lent their support by purchasing games through Game Salute, supporting their local Select Stores, volunteering as Ambassadors to show games off at shows and in their local community, and letting other folks know what we do. Tom: Game Salute is not just for game industry pros. There is a lot for the gamer too. Can you talk about some of the things you have aimed right at us regular gamers? Dan: We offer lots of great games from awesome design studios, so that’s the most important thing. Every game isn’t for every player, so we want to enable you to find the games you’re going to enjoy most. We also offer GameStoreLocator.com so that folks can know what local stores are carrying their products. And you can visit Game Salute News at GameSaluteNews.com, on Twitter (@GameSalute) or at www.Facebook.com/GameSalute to stay abreast of what’s going on in the industry. We’re also looking forward to rolling out more support tools to making gaming more fun for gamers all over. Tom: You also do a lot of support for retailers. Talk about that. Dan: We offer a lot of tools and services to enable stores to provide the best play environment and local support for their gaming communities. We offer Preview Nights where stores can show off and sell games about a month before the regular release date. We send customers their way through GameStoreLocator.com. We provide demo copies of games at a reduced cost so that stores can have a Game Library to share with their customers. We offer our Buy Local service through Shop.GameSalute.com so that folks can purchase their favorite games at their local stores. And we’re always looking for additional ways to support stores. Tom: Speaking of retailers, Dan, can you comment on the recent upswing in distributor exclusives? Dan: There are a ton of reasons why this proliferation of exclusives exists – mostly that publishers need better information and logistics control in order to survive and thrive in the industry today. We’re going to see more of this consolidation and provided that these result in additional support and value for stores selling the product and consumers purchasing the product, those will be good things. Tom: Game Salute is doing a lot of community support. I noticed that you support The Jack Vasel Memorial Fund, Extra Life, The Creative Play Project, and others. Can you discuss that? Dan: It’s simple, really. We have a ton of opportunities to help others and share the good that games can bring to life. These efforts are great ways to demonstrate that through active service and support for the community. We donate games, time, and money to these efforts to help them thrive. It’s an integral part of supporting the gaming community. Tom: Ok, Dan. Here’s the big question or subject on everybody’s mind – Kickstarter. What are you thoughts on it? Good for gaming or hurtful? Dan: Kickstarter, like most innovations, has upsides and downsides. We’re seeing a lot of innovative projects getting made that would not otherwise, but we’re also seeing a lot of projects where the creators don’t have the experience or wherewithal to follow through and deliver at the level of quality we’d expect. We need a combination of personal passion and professional support in order to use that platform to its fullest extent and end up with more quality games rather than just more games. Tom: You recently attended PAXEast. How did it go? Dan: PAX East was a blast! We had a huge booth in the Tabletop area and folks there all weekend playing games in the Tabletop Arcade section, buying games from the Game Salute store, and generally having a good time 🙂 Thanks again to all our staff and volunteers who worked so hard to make that show a success. Also, thanks to all the folks who attended my seminars on Kickstarter and Getting Your Game Published. If you missed us there, we’ll be at Origins, Gen Con, PAX Prime, and BGG.con later this year. Tom: Dan, it’s always fun talking to you. Thanks for being my guest on Go Forth And Game and informing us on what Game Salute is all about. Thanks for providing such an varied and excellent service to us all. I wish you lots of success. Visit Game Salute and check out they have to offer. It’s really a great site. Off Your Rocker is almost there.